Home » Treatments » Adena IPL Hair removal. 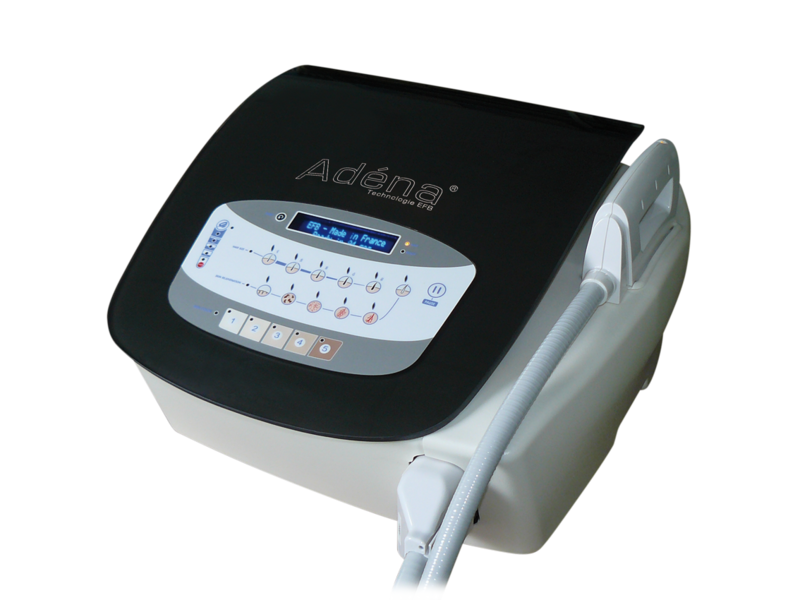 We use – Adena IPL -this French medical technology was developed by EFB, designed and manufactured in France. There are three main benefits of Adena’s advanced technology we believe It is safer, less painful and very successful. For ALL HAIR types – even RED, BLOND, GREY, WHITE. Since these hair colours have no melanin, IPL doesn’t work. However, the Adena has a separate, new patented hand piece for this type of hair that targets the hemoglobin instead of the melanin. We wax the area to be treated beforehand to increase the blood flow for a more successful treatment. Please book a complimentary consultation with one of our IPL specialists to evaluate your skin and hair, to have a patch test, estimate the required number of treatments and to provide the instructions for before and after the procedure. All our Hair Reduction treatments are performed by qualified, certified and experienced IPL Technicians. IPL hair removal is probably the best option for hair reduction. IPL's unique design allows customised treatments according to the colour, texture and location of hair growth. Any hair - black, brown, red, blonde, white and grey hair can be treated effectively with new patented technology from Adena. Pulses of Intense Light penetrate the skin and heat the hair shaft and follicle which causes an effect on hair growth. A series of treatments is required to effectively reduce your growth. Your IPL expert will advise the amount and frequency of treatments you require. Removing the visible signs of ageing can take years off your appearance giving you a smooth clear skin. A course of IPL treatments is required and excellent long term results are possible with a healthy lifestyle and careful attention to the proper use of good skincare and sunblock. Pigmentation, discoloration and sun spots can all be treated effectively with IPL providing you with the clear and even complexion you have always wanted. A course of treatments is required and excellent long term results are possible with a healthy lifestyle and specific products to target the pigment producing skin cells and of course the daily use of sunblock. IPL Treatment for Red Veins. Redness flushing and damaged or broken capilaries respond well to IPL Treatment. Your therapist will consult with you to establish the best IPL treatment protocols and homecare products to help strengthen your capilaries and improve skin density.